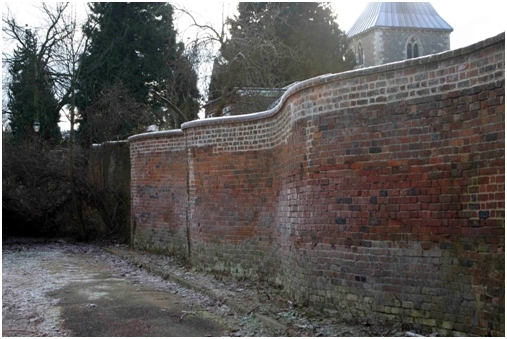 The former garden of the Old Rectory is bounded on its eastern and western sides by crinkle-crankle walls - brick walls built in the shape of a wavy line. They date from the early 19th century and are the only publicly accessible example in Hertfordshire. There are several reasons why the walls were constructed in this way. The shape enabled them to be made taller using a single course of bricks than would have been possible if they were straight. The curving lines gave strength to the structure, allowing the walls to stand without buttresses and to expand without cracking in the sun. The alcoves were used for growing and ripening fruit, a process often helped by circulating warm air from a stove through vents in the brickwork.. The Old Rectory itself, which is also Grade II listed, conceals a 16th century timber-framed building within its 19th century brick exterior. The red brick chimney stack dates from the 17th century. King Edward Place, on the other side of the road, was built on the site of the factory of Helmets Ltd, founded in 1924 and once a major employer in the village. They made pith helmets, flying helmets, firemen's and police helmets, and crash helmets. The factory closed in 2002 with the loss of 200 jobs. To see a video of their work, made in 1953, go to www.britishpathe.com/record.php?id=47537.